Truly MAGICAL items - a superb purchase, not only for 13th Age! Wow, it really sounds like a good book on magic items! I may have to look into it, though i have no plans currently to begin playing 13th Age. Seems like it could give enough inspiration to be worth using even though i probably wont run anything other than PF or OSR/old-shool D&D. There’s no reason why magic can’t be that way in Pathfinder, and there are various supplements out there that dispel it. That is correct, though the argument is in favor of magic ITEMS. I can name a lot of magic systems and spells that fit this criteria. As for magic items – well, your Socketed Items and Scalars managed that, but that does not detract from the veracity of the claim that the majority of magic items for PFRPG remains an endless recombination of fixed effects (with more being added as new weapon qualities), a practice that undermines the “unique/distinctiveness”-factor magic had to a greater extent in previous editions. I’m not bashing on the existence of such items; however, I do feel that the quirkiness of the items in this book can be exceedingly inspiring for all GMs. One Bling to Rule Them All: Scaling Magic Items: The other one by Brad: Custom build your scaling item that improves over the levels! Less experimentation, but also very fun and an integral part of my campaign. Purple Duck Games’ Legendary…-series also features a LOT of cool scaling magic items, though not each installment is stellar. Rite Publishing’s item-books tend to be more conservative design-wise, but their items also do some cool high-flavor stuff. That would be my first impulses to recommend re items. If you need more, drop me a line with more precise specifications! Exactly. I’m currently btw. using the hat sans modification in my games – sure, it has no market price or crafting info, but in my home game, I don’t care. Converting these to old-school shouldn’t be much of a hassle, btw. As for PFRPG – if you’re fluent in both systems, conversion isn’t hard. If you’re looking for inspiration – well, then this book delivers in buckets! 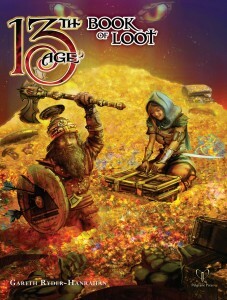 This is the one 13th Age book I don’t have! And reviewed on my birthday no less! I was set to skip this one, being “just another magic item book;” I’ll have to rectify this fact. Thank you as always, Thilo, for writing such diligent and well thought out reviews! A belated happy birthday to you, Ken! Glad I could point you towards this actually being a good book!